I think most of us agree that if something's worth doing, it's worth doing right. And that goes for listing. Listers, and in this case state listers on this East Coast of the United States, have to operate by a set of rules in order for two people's lists to mean anything in relation to each other: the bird must have been alive; it must have been wild; and, most importantly, it must have been seen in the state. However, when it comes to pelagic borders, the rules aren't so clear. Determining a state's offshore border is not nearly as easy as it is on land. Yet, these pelagic birds count just as much for a state's list as any other. A recent exchange on the ABA Birding News - Seabird News List about defining East Coast pelagic borders has inspired me to try to put the different theories in one place. Quite frankly, it's amazing to me that there isn't a nationally-accepted set of offshore boundaries. I suppose the explanations are simple enough, however: it's more difficult for the average birder to determine his or her position at sea (until recent advantages with smartphones, etc., that is), and, more importantly, the fact that states want as much pelagic space as they can get. Either way, I want to try to collect some info on the different systems. I am very thankful to those who posted on the Seabird News thread, from whom I am cribbing: Paul Guris, Brian Patteson, Alvaro Jaramillo, Angus Wilson, William Bourne, Marshall Iliff, Nate Dias, Tom Robben and Tom Brown. The American Birding Association wraps up the pelagic boundary question with a tight little sentence: "Birds observed on or over an ocean are counted for the area having the nearest land, if within 200 miles." It's as easy as that. If you see a bird out on the ocean, figure out which state's land is closest to you, and that's what state the bird should count for. Now, the distaste for this system for some states is obvious. Look at Delaware. Look at Virginia and Rhode Island and Georgia and New Hampshire and poor poor Connecticut. Listers in those states (depending on how they've listed previously) may have a lot less water to find birds in. Not surprisingly, then, other systems have sprung up so that birders states with less-than-ample coastlines can enjoy the open seas. 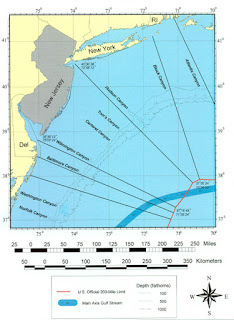 The lines were drawn from the states borders so that they match the corresponding dips and bumps in the EEZ: for example, the angle of the north New Jersey boundary line connects to the point on the EEZ that reflects the turn from New Jersey to Long Island. It's a system that Delaware is certainly more excited about, but to my knowledge it has only been adopted by the Records Committee of one state: New York. Mr. Buckley calls his system "objective, legal and consistent," in that it conforms the state boundaries to the EEZ and provides straighter, more reliable lines. Due East lines, easily enough, run latitudinally from a state's border due east (or west, on the other US coast). Where the land boundary already runs east/west, this pelagic line is simply a continuation to the EEZ. Where other features dominate, the lines just run east/west from the chosen border or feature. These lines have the advantage of being easy to map and bird within ("If you're between X and X, you're in NC waters. "), but they have the disadvantage of shorting the coastal waters of some states. For example, the waters not far off the generally east/west lying Long Island belong to New Jersey in this circumstance. There are state-specific systems as well. For example, very informative paper by Paul Guris in New Jersey Birds on an update to New Jersey's pelagic boundaries explains the methodology behind that state's change. The lines were built upon Buckley Lines, but altered to take into account historical records which - due to their lack of specificity - could not be precisely set and were thus at risk of being cast adrift by a shift in the state's pelagic boundaries. The new border, shown in the above-linked PDF, are an attempt at a "best of an odd situation" system. 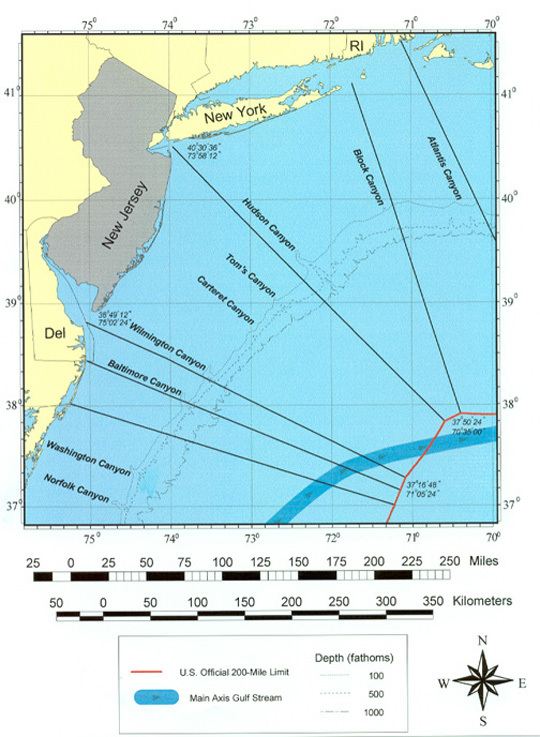 The NJBRC members recognize that these boundaries produce substantial overlap with the pelagic waters recognized by the New York and Delaware records committees and birders. Given that the committees from those states did not consult with the NJBRC when determining their pelagic waters, and thus no multi-state 'group decision' was reached, we did not feel constrained by their decisions. In the eBird Era, precision and uniformity of bird records has become the priority. EBird records are rapidly replacing state record committees in terms of geographic reliability (not yet authenticity, however, though it's moving in that direction). Birders deserve a unilaterally-accepted set of pelagic boundaries, not individual boundaries selected by state records committees. (State bird records committees are invaluable, don't get me wrong, but the geographic dominance of eBird is undeniable). The only inarguable system for setting pelagic borders is Nearest Point of Land. It's definitive and reliable, and it's logical. While the system will leave several states with much less pelagic water then they've historically counted in, birders will deal. They'll scour those waters more carefully. They'll run pelagic trips specifically for those waters. They'll enjoy the challenge. Good birding! To me, Nearest Point of Land makes the most sense, but I could see an argument for the Buckley system. Ultimately though, what's important is to have a single standard that the records committees agree to recognize. The most useful of all these systems would be to do away with the semi-arbitrary rules/regs/systems and just use GPS coordinates. In terms of science, this is the only really useful data. Sure, state records are important, but GPS coordinates ignore political boundaries and are the most informative for science. If you are on a pelagic bird trip, the chances are slim that the captain can't tell you what your GPS coordinates are. I've never understood the fascination for, obsessive nature regarding, or the importance of state listing. Is it something to do with ego?